I absolutely love the flavors in this Loaded Grilled Eggplant with Creamy Herb Sauce! It is the perfect vegetarian dish to serve all season long! Fresh herbs, bold flavor, creamy sauce, and the meaty vegetarian filling make this dish a favorite! 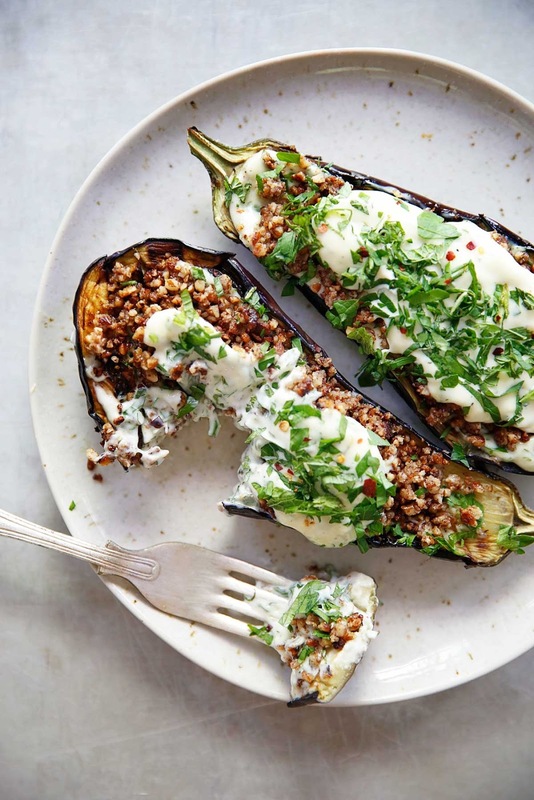 It’s Whole30-compliant, packed with healthy fats, and a great way to use up all of those fresh herbs and all of the eggplant growing right now! If you have ever cooked with baby eggplant before you know that they are not just adorable, but also have a slightly sweet flavor. The combination of the grilled baby eggplant with the savory creamy sauce is perfection. We now want to use this sauce on everything! 4 Baby or Italian eggplants, sliced in half with the stems kept. Place all dressing ingredients in a blender and blend until well combined. Taste and adjust seasoning as needed. Place dressing in the fridge until ready to serve. In a small saucepan, add the ingredients for the nut crumble over low heat. Mix until well combined and toast the nuts until fragrant. About 5-10 minutes. Set mixture aside until ready to serve. Slice eggplant in half and score the flesh. Brush with olive oil and spices. Be generous with the olive oil and spices in this step. Heat and grease grill or grill-pan. Once hot, place eggplant on the grill, flesh side down. Grill for 3-4 minutes on each side, until golden brown and soft to touch. Place Grilled eggplant on desired serving dish. 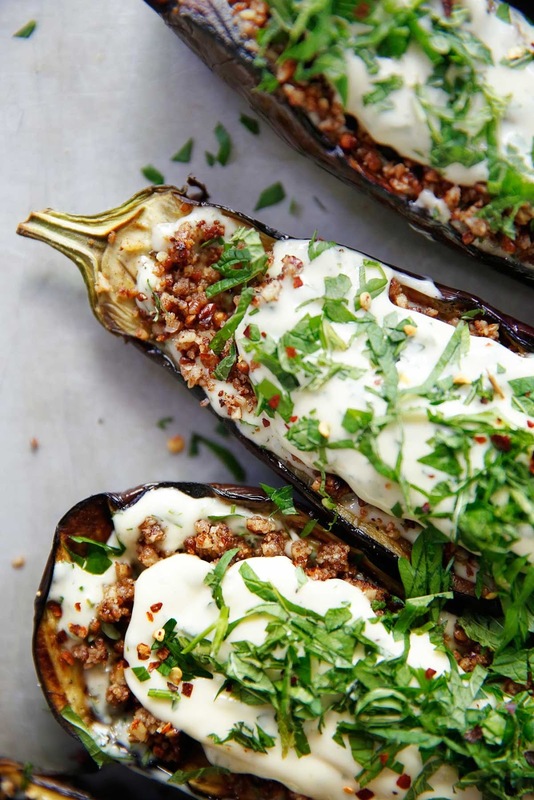 Smear a generous amount of dressing onto each eggplant. Top with nut crumble and herbs. Serve warm! *You can use regular eggplants here, but we find that this tastes best when you use Italian or baby eggplant! 0 Response to "Loaded Grilled Eggplant with Creamy Herb Sauce"